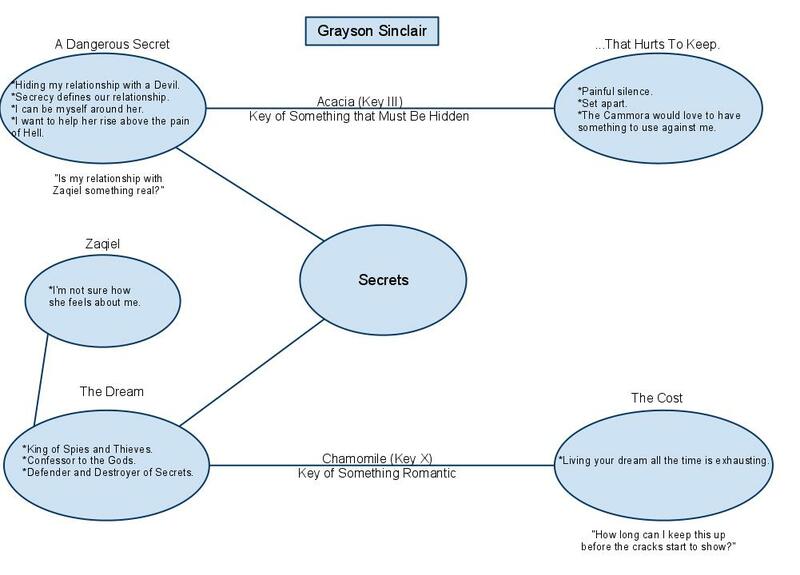 Looking inside my head: Grayson's mind is so packed with secrets, ranging from beautiful to horrifying, that to try to read his mind, even for surface thoughts or one specific secret, is like trying to drink from a fire hose, even for another Power. Somnus and Tactitum: Two pistols that fire tranquilizing darts and are wondrous Anchors. Anyone hit by their darts (who can't defend) immediately and silently loses consciousness and drops slowly and quietly to the ground. The dart dissolves long before they wake up. The Third Eye: This is Grayson's intelligence agency, another Anchor. Its agents are scattered through many worlds, including his Chancel and Earth. Grayson Sinclair is a somewhat stereotypical middle child. He was always a bit desperate for Praxael's approval and insecure about Praxael's affection for him. At times, he could be resentful of his older siblings, whose relationships with the Angel looked so easy, or of his younger siblings, who seemed to earn forgiveness for their faults so easily. At other times, though, he was the fun brother, who always knew the best gossip and the wildest events to show up at and who was always ready to help bury the bodies the next morning. In life he always dreamed of being a spy but was instead depressingly normal. As a Noble, he is not just the perfect spy but the Lord of Spies. Most of the time, this is exhilarating, but occasionally it gets exhausting, and even feels a bit empty. At times he serves as a confessor, not just for his familia but for anyone desirous of someone to confess to and willing to trust him. This is how he first met Zaqiel, a devil with sins she couldn't talk about with her Powers or her fellow Imperators. And maybe it was the stress of always trying to be perfect for Praxael or maybe it was that she saw through his facade or maybe it was the burden of carrying everyone's secrets inside his head, but Grayson found himself engaged in a strange flirtation with the devil, which soon grew to a full-blown affair. As time passed, Grayson has come to care very deeply about the devil. It's hard to tell if she feels the same way about him; as tends to be the case with devils, she's not very good at expressing herself to people who don't share her experience with Hell, and so much of her existence is pain. She keeps coming back to him, though, which is something.